Hurst Boiler specializes in the design, engineering and manufacturing of wood fired steam and hot water systems. Hurst Wet Fuel and Dry Fuel Configuration Solid Fuel Fired Boilers are specifically designed to utilize a wide range of standard and alternative fuels such as: Wood, Agricultural Back-up, Gas/Oil, Bark, Chipped Mill Waste, Coal, Construction Debris, Hulls, Hog Fuel, Manure, Paper, Rubber, Sawdust, Shavings, & Sludge. Hurst Boiler provides its clients with the support and expertise necessary to design, fabricate and install complete wood boiler systems, from the fuel storage system thru exhaust gas emission mitigation. 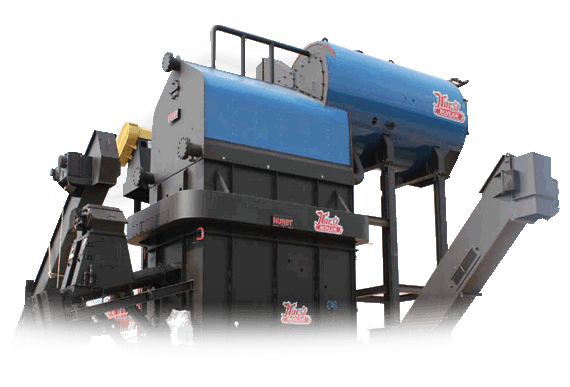 Various Hybrid Wood Boiler designs are suitable for applications to produce high pressure steam or hot water in ranges from 3,450 - 60,000 lbs/hr (3.4 mmBTU - 60 mmBTU) output from 100 up to 900 PSI.